You are here: Home » Learn & Live the Faith » Catechesis » Did Neanderthals Have a Soul? Did Neanderthals Have a Soul? “The magisterium of the Church takes a direct interest in the question of evolution, because it touches on the conception of man, whom Revelation tells us is created in the image and likeness of God…. “The moment of passage into the spiritual realm is not something that can be observed in this way—although we can nevertheless discern, through experimental research, a series of very valuable signs of what is specifically human life.” Pope St. John Paul II, Message to the Pontifical Academy of Sciences: On Evolution. Pope St. John Paul II laid down issues of evolution, ensoulment and monogenesis in his address, quoted above. Yet I still have questions, which came to mind as I listened to the audiobook, Rise of Humans: Great Scientific Debates, by John Hawkes. The Neanderthal genome has been explored in detail, to show that there is a 99.7% similarity between human (homo sapiens) and Neanderthal DNA. Moreover, there is strong evidence that Neanderthals ceremonially buried their dead, perhaps an indicator that they believed in life after death. Here, then, are several questions that occur to me. Some have been answered, at least partially, in Kenneth Kemp’s article, Science, Theology and Monogenesis. I ask the reader to assess critically these questions and some answers given below, because there seems to be a conflict between what paleoanthropology and genomic research tell us and what we are to believe from Catholic doctrine and dogma. The evolutionary theory I have read suggests that new species arise not from one or two individuals, but from populations. If new species arise from differences in DNA, and these differences occur because of mutations, how is it that for a large number of individuals the same mutations occur that give rise to a new species (within some limited time period)? Definitions of soul from the Catholic Catechism and from the writings of Thomas Aquinas state that the soul is the “form” (in the Aristotelean sense) of the body, but immaterial. Rational faculties, the capacity to reason and to form abstractions, are attributes of a soul. These are presumably necessary conditions for there to be a soul. Are they sufficient conditions? What kinds of archeological data would provide evidence for such rational faculties of a hominid–tool making, art, burial of the dead? Does genetic similarity between two species, and the possibility that interbreeding has occurred, imply that if members of one species possess a soul, so do members of the other? Even if “biological” monogenesis does not obtain, what might be termed “theological” monogenesis could occur, and so Pius XII’s objection could be encountered. This proposition has been explored in some detail by Kenneth Kemp, in his article Science, Theology and Monogenesis, which will be discussed at greater length below. Is it the case that biological monogenesis did occur? Some evolutionary geneticists have justified the idea of descent from one ancestor (or a pair of ancestors) by the “Mitochondrial Eve” hypothesis, which proposes that all humans are descended from an African lady who lived some 100,000 to 200,000 years ago. The Mitochondrial Eve hypothesis has been criticized by evolutionary geneticists who argue that “bottlenecks” (small population sizes) lead to minimal genetic variation and thus lower survival of species. Francisco Ayala has examined the variation in the gene DRB1 and concludes the variation is too large to admit of a small population (bottleneck) as ancestors. * Ayala’s calculations have been criticized as being biased and limited in assumptions. Let’s bypass the question of biological monogenesis and turn to Kemp’s proposal for theological monogenesis. “The biological species is the population of interbreeding individuals. I won’t give Kemp’s arguments in detail, but only a summary–please go to the original paper for a complete story. He supposes that a small population, about 5000, existed with the necessary physical characteristics (“body”) for rational activity. God selected two of these, a man and woman to be endowed with a soul, the capacity for abstract thought: e.g. to know that one would die, to have knowledge of one-self as an individual (self-consciousness), etc. When would Adam and Eve have appeared in human pre-history? That point is not clear. Certainly tool-making is a necessary but not a sufficient condition for rational activity in the sense Kemp would take. Pebble tools go back to Homo Habilis some 2.6 million years ago, and in more advanced forms, possibly requiring rational forethought, to Homo Erectus, some 2 million years ago. 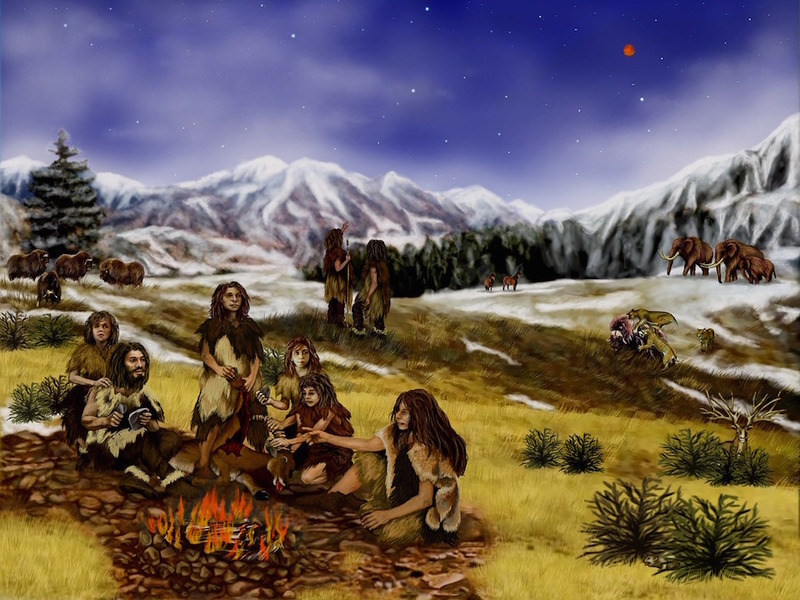 Neanderthal man had a sophisticated tool-making capability, used fires, buried his dead with accompaniments. As pointed out above, genomic analysis of Neanderthal DNA shows a 99.7% similarity to that of Homo Sapiens. Moreover, rcent genome analysis of homo sapiens skulls show some interbreeding with Neanderthals, although that conclusion is controversial. The questions raised at the beginning of this article have been answered only partially. It is unlikely, but not impossible, that biological monogenesis occurred. If we accept (as I do) that mind, self-consciousness and what we please to call “soul” are not solely a physical thing, but are immaterial, then we still are in the dark as to what constitutes paleo-archeological evidence for rational activity, activity that is sufficient to show that individuals in a species are endowed with souls. We are unsure when in pre-history God gave two individuals their souls, and continued to do so thereafter for each of their descendants. To the question put in the title, I would answer “Yes!”, Neanderthals did have a soul. I would argue that any species that buries its dead has knowledge that life will end, and is therefore endowed rationally. Finally, to all who would dispute that there is such a thing as a soul, and that mind/consciousness/etc. are purely physical phenomena–you’re welcome to your opinion, but I (and many others) don’t agree with you. well as very long-lasting ones, as such bottlenecks are too small to transmit the observed range of variation to succeeding generations. …Ayala calculates that the minimum bottleneck sufficient to maintain that level of diversity (and then to return to the mean population size) is about 4,000 synchronously reproducing individuals, or perhaps slightly less. That suggests an actual population of some 15,000–20,000 individuals.” Kenneth Kemp, Science, Theology and Monogenesis. **Note that a similar story is given for an original “Adam”, traced through the Y-chromosome (passed from father to son), who lived 100,000 to 200,000 years ago. Whether Y-chromosome Adam and Mitochondrial Eve were alive at the same time and had children is an interesting question, to which we’ll not know the answer (while alive). Francisco Ayala, Am I a Monkey? Warren Brown (author), Nancey Murphy (editor), H.N. Maloney (editor), Whatever Happened to the Soul? Bob Kurland is a retired, cranky, old physicist. Convert to Catholicism in 1995. Trying to show that there is no contradiction between what science tells us about the world and our Catholic faith. Intermittent blogs at Rational Catholic and adult education classes here to achieve this end. Extraordinary Minister of Communion volunteer to federal prison and hospital; lector, EOMC. Sometime player of bass clarinet, alto clarinet, clarinet, bass, tenor bowed psaltery for parish instrumental group and local folk group. And, finally, his motivation: “It is also necessary—may God grant it!—that in providing others with books to read I myself should make progress, and that in trying to answer their questions I myself should find what I am seeking. Therefore at the command of God our Lord and with his help, I have undertaken not so much to discourse with authority on matters known to me as to know them better by discoursing devoutly of them.” St. Augustine of Hippo, The Trinity I,8. Quantum Mechanics & the Real Presence–Which Reality Do We Believe?